A Flying Nightmares PBJ airborne over the Solomons in 1944. 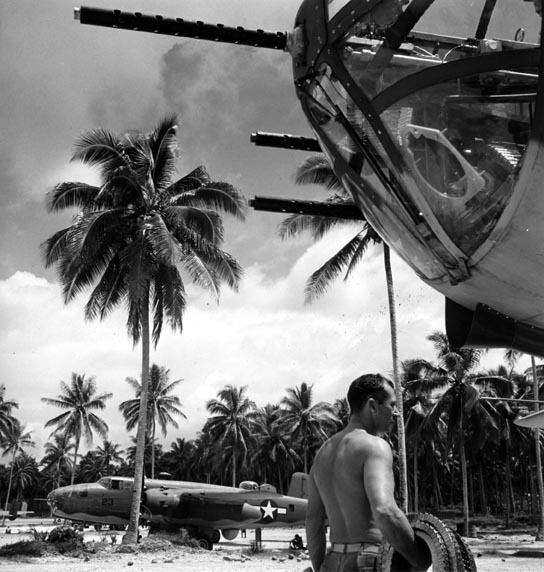 Though the exploits of the USAAF’s medium bomb groups in the Pacific are well-documented, much less has been written about the U.S. Marine aviators who flew the Mitchell in combat out there alongside the 5th and 13th Air Force B-25 units. 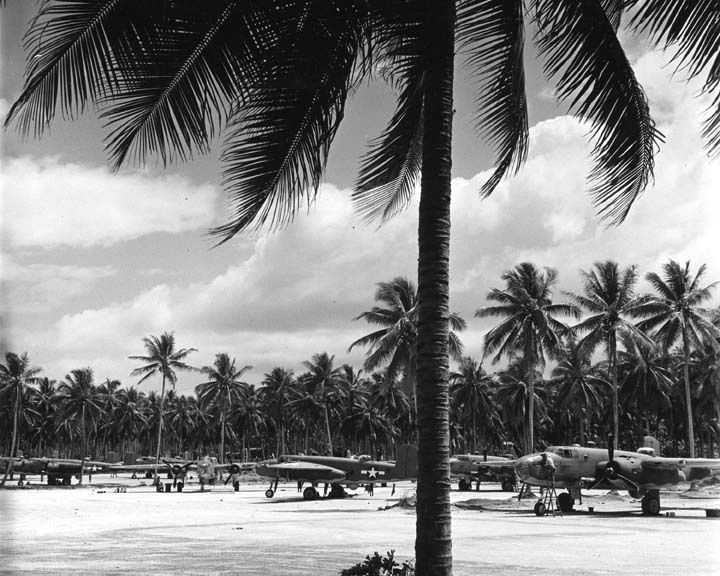 The Marines deployed seven PBJ Mitchell squadrons to the Pacific during the war, where they arrived first in the Solomon Islands in early 1944. The Flying Nightmares, VMB-413 earned distinction as the first PBJ outfit to enineter combat. 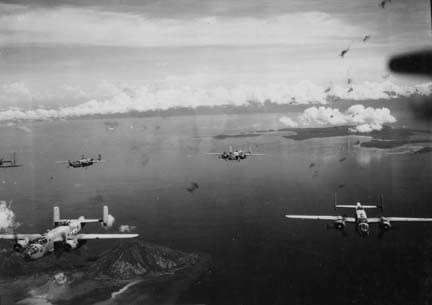 Operating against Rabaul and Kavieng against heavy anti-aircraft opposition, the squadron lost twenty-seven men in its first sixty days in combat. 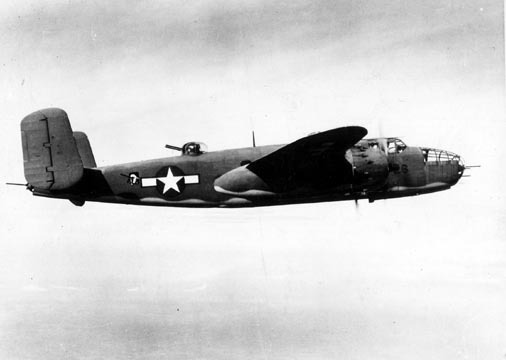 Despite the losses, they had pioneered a new attack technique: While the 5th and 13th Air Force B-25’s pounded New Britain and New Ireland during daylight, the Marines of the ‘413 went in at night. In May 1943, the Nightmares were pulled out of combat and sent back to refit and reform. VMB-423 replaced 413 that month, and they began combat flights almost immediately. One of the PBJ’s that 423 took into battle had been paid for by a war bond subscription campaign started by some school kids in Oklahoma. By the time it was finished, some 35,000 kids had taken part in the effort. The children had all signed their names on a sixty-five foot long scroll that the unit brought with them to the Solomons. 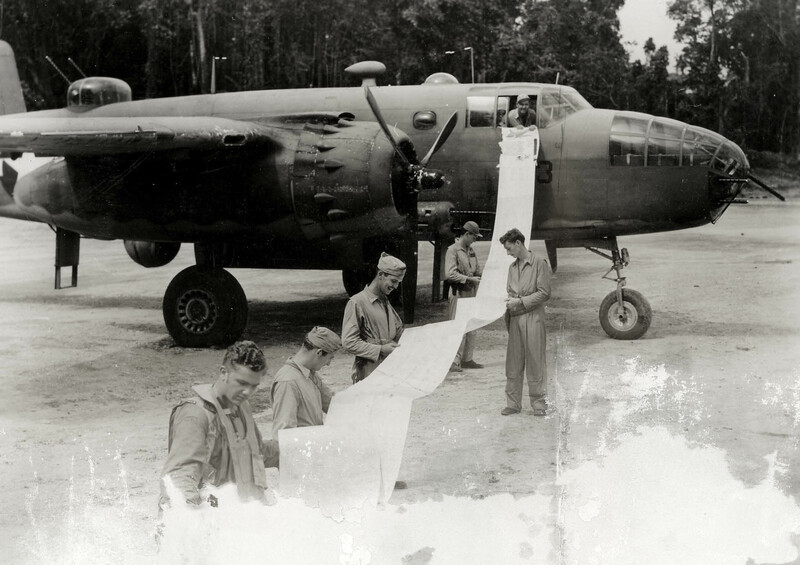 On one of the squadron’s first missions, they dropped the scroll on the Japanese during a bombing raid over Rabaul. The Oklahoma scroll. Hard to imagine American public schools helping to raise money for combat aircraft today. More PBJ squadrons arrived in theater during the course of 1944, including VMB-611 which flew its first night raid over Kavieng in November 1944. The following year, most of the PBJ units moved into the Central Pacific and flew from the Marianas, Iwo Jima and Okinawa. VMB-611 went to MAGSZAM–the Marine air formation that supported the Army in the Southern Philippines. VMB-611 under LTC George A. Sarles began flying from Zamboanga, Mindanao in March of 1945. In the two months that followed, they became experts at close air support, blasting targets in front of the 41st Infantry Division and other Army & Filipino guerrilla units fighting to liberate the island from the Japanese. VMB-611 at Moret Field, Mindanao. It was an assignment that received little recognition or publicity. The men of 611 flew constantly, wearing themselves and their aircraft out as their attacks helped minimize Allied ground casualties. They flew 173 sorties in two months. 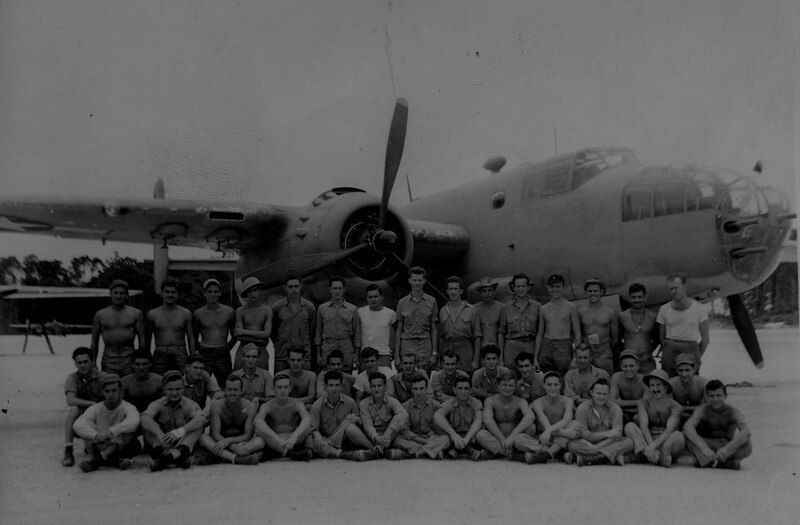 At the end of May, Sarles’ and his crew went down during a bombing run over Japanese defensive positions on Mindanao. Though some of his crew escaped the wreckage and made it back to friendly lines, Sarles was killed. During that spring, VMB-611 suffered nine missing or killed in action, nine wounded and lost four aircraft to the intense Japanese ground fire they encountered on nearly every mission. ‘611 at Moret Field, Mindanao. VMB-611 was not relieved or rotated out of the line to give the crews a break, as had been standard practice in the South Pacific. Instead, they flew continuously in combat until August 1945 when the war ended. One PBJ pilot noted that in 50 combat missions, he never saw a Japanese plane in the air. That lack of aerial opposition did not mean their task was an easy one. In seventeen months of fighting in the Pacific, the seven PBJ squadrons lost 45 aircraft and 173 men as they carried out some of the most difficult and unheralded aerial attacks of the war against Japan. The constant strain of night attacks and the seemingly never-ending days of flak-filled skies took a psychological toll on all the crews. At night, friends would sortie on heckling missions, only to never return. Their fates remained unknown and are largely lost to history. Dedicated to reader David Fish, whose father was one of those PBJ crewmembers who went MIA on a mission with VMB-611 in May 1945. Forty-two of the fifty members of the Philadelphia South Pacific Club. All hailed from the city of Brotherly Love, and they were by far the largest contingent of men from one spot back home in the Marine Air Groups serving in the 1944 campaign against Rabaul. 1st Lt. Charles A. Jones, my uncle, was also lost wit Col. Sarles. Thank you for the post. David, thank you for writing. Can you tell us a bit about your uncle? Really interesting, thanks a lot. I have a feeling that the Luftwaffe had their personnel serve in this way. It seems rather strange to us nowadays, perhaps. Shared on Google+ with a few of my Marine buddies; hope you don’t mind. Share away, my friend! Thank you!